Welcome to Ox Hill Devons Farm. My name is Andrew Van Ord. Along with my dad, Howard and our families we operate a small hobby farm located in the beautiful Kinzua area of north western Pennsylvania. We are passionate about promoting American Milking Devon cattle and the use of oxen. After years of living away from the farm, my wife Kathy and I recently purchased the family farm. Our plans are to continue training oxen, selling ox equipment, and to raise a herd of traditional American Milking Devon cattle. I am a product of the 4-H working steer program and have been training and working cattle for as long as I can remember. Oxen have been a great father and son project over the years and I have learned and continue to learn a great deal from my dad. I make no claims to be an expert, but what I post on this site is what works for me and I share it in the hope that it can help others. 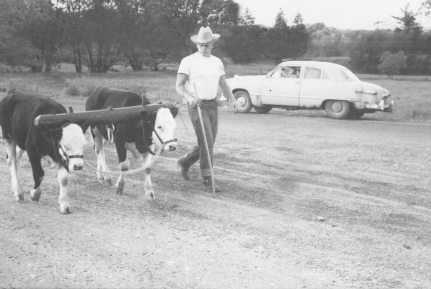 My father, Howard VanOrd broke his first team in 1957 and has been training oxen ever since. He has trained and sold oxen all over the eastern United States. 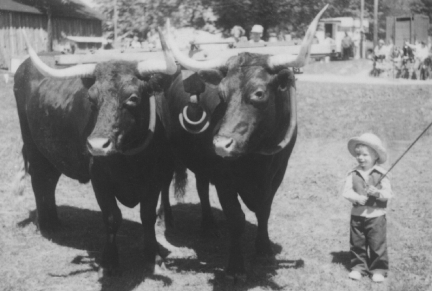 He started the only 4-H ox club in Pennsylvania and was an active 4-H leader for over 30 years. In addition to assisting 4-H members and local teamsters craft thier own yokes he has made all of his own yokes and has sold and shipped countless yokes for teamsters all over the country. He is particularly known for using a single ox and using cows as oxen.